You've voiced your opinions on Anne Hathaway's fluctuating figure and Emma Stone's auburn-to-blonde transformation. This time around, we want to know what you think of former child star Miley Cyrus's new cropped 'do. Miley, who broke into the scene as the namesake of Disney's TV show Hannah Montana, is known for her long, wavy brunette tresses. However, signature locks aside, Miley is not one to shy away from the shears or peroxide. Thanks to the constant hounding of the paparazzi, Miley's fans have been able to watch her evolving hairstyles, from mid-length hair to her famous long locks in blonde, dark brown, and auburn. 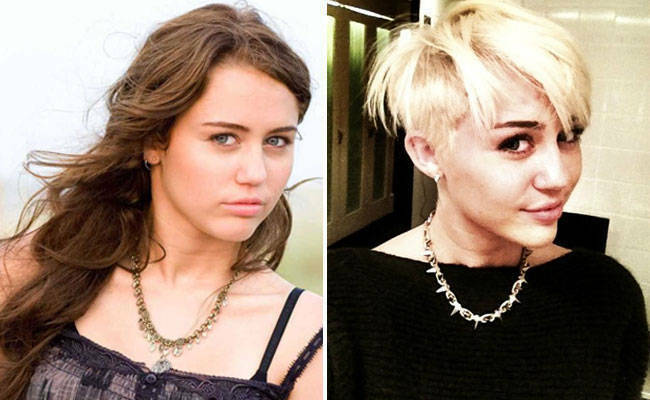 Given her constant hair reinventions, you would think that Miley's fans would be past being shocked over any new 'dos. Miley took to her Twitter to share her journey to a pixie cut, first tweeting a photo of hairdresser Chris McMillan about to cut off her long hair which was tied in a bun on top of her head. Miley then tweeted a photo of herself standing in front of a mirror, grinning and biting her finger as she proudly shows of her new pixie cut. The radical 'do caused an uproar on Twitter and no small amount of negative reactions to her tweets and photos. But there's no shortage of supporters for Miley's new cut, too, including her fiance Liam Hemsworth, who Miley says "loves" the haircut. "Last night he said I look the happiest he's seen me in a while," Miley said. Meanwhile, comedian and host Ellen DeGeneres tweeted a photo of herself edited with Miley's new 'do, saying "I love @MileyCyrus's new haircut so much that I copied it." To naysayers, Miley has this to tweet: "Feeling so happy in my skin. My dad @billyraycyrus used to tell me, 'Opinions are are like a** holes--everybody has one.' LOVE my hair. Feel so happy, pretty, and free." She went on to say, "Self-love is the greatest of all flatterers." What do you guys think? Do you wish she'd kept her locks long or are you happy with her new pixie cut? Vote in our poll now and sound off in the comments section below!